work will work in ANY drought stricken area. It just takes your attention and a few minutes of focus. Please share if you resonate with the work. LET LIGHT UNITE! I always ask for permission from the Creator to do this weather work before I start. I ask that whatever the reason is that drought is being created in the state of California (or any desert/dry/waterless area of your choice) whether man made, HAARP, Geo Engineering , the CERN or magic made is cut from those sources. As the ties are cut I call the violet flame into the area to clean up all out of balance energy. Then sending the Angelite energy to heal. Now lets reconnect all of these areas back to the Creator. I also ask that there is a big drop in barometric pressure pulling all clouds into the area. I call to any water elemental in the area to now release moisture into the air including oceans, rivers, lakes, streams, puddles and water catchments. 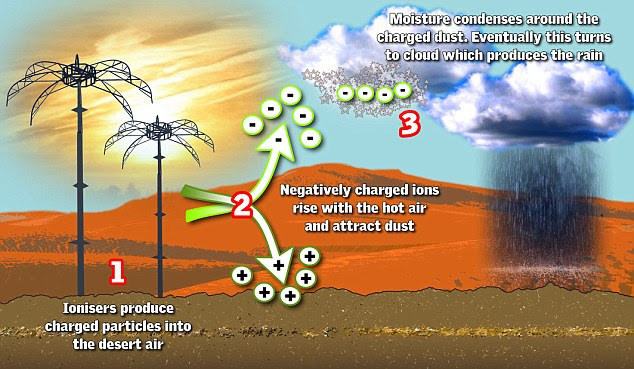 As the moisture is released into the air along with negative charged ions we see clouds begin to form, getting darker and heavier as it fills with moisture. Imagine the clouds growing in size getting darker and now see it gently rain until there is enough rain to put the area back in balance. We want GENTLE, LOVING, KIND rain. Always end not my will but thy will be done. We are going to do more advanced work now. I have written 2 power prayers to break down the H.A.A.R.P. elementals. Use whichever works the best for you. The first is about how to do this work in a group and the second prayer is shorter and one you can say quickly. Action Prayer to cut elementals free from HA.A.R.P. However you normally open up a group meditation circle will work. I like to call to all the ancestors, angels, elemental kingdom and Divine deity’s, Gods and Goddesses to also join…like Jesus and the rest of the Gang (Buddha, Kwan Yin, Mother Mary ect.) He hangs out with. I also will close the opening circle so only that which is light may enter. Then I do a short meditation on Love so it fills us up completely so everyone can raise their energy as high as they can. I bring down God’s divine healing energy thru the top of my head (crown Chakra) let flow thru my body down my arms and out my hands and I imagine I am forming a bubble of white light in the center of the circle above the crystal. Whoever is speaking will speak while the others are pouring this energy into the bubble amplifying their words. Whoever will speak should use the power of the spoken word (which is the bases of creation) and the more feeling and intent and force you put behind your words the quicker they will manifest. In this bubble I place this action prayer. I call to Michael the Archangel to come forward with your sword of blue flame to cut ties to all H.A.A. R.P. programs on the planet, where ever they are located, and cut all ties to every piece of equipment of the H.A.A.R.P program from whomever or whatever created you. No matter what material you are made off, rock, mineral, plant, animal or extraterrestrial based anything. As the ties are cut I call the violet flame through all the elementals in the harp programs to cleanse and purify their energies of all negative vibrations they have taken on. See the violet flame transmuting and re-purifying this energy back to light. We fill them up with the energy of the Angelite to heal them. We now reconnect these elementals to the Creator seeing them fill up again with God’s pure Divine love. Now we command them to be neutral, to not work, to break down and to keep breaking down. We ask the Angels to go forth and direct some of this energy to all the week spots in the H.A.A.R.P. machinery and have permission to bend metal or move any loose wire that helps break the machines down. Doing so in a way where no one or anything will be neither hurt nor harmed. We ask that all computers connected to the H.A.A.R.P program start breaking down and all the information on them goes invisible as well with all the backup systems. We call to all the rats , mice, bats, fleas, snakes, birds, mold to infest all this equipment and help us break it down so it no longer works. Surround all the electrical equipment with such high energy that anyone who goes around them can’t function and goes dyslexic (just around the equipment.). Putting in wrong information and /or just being very forgetful. Unconsciously making mistakes in the H.A.A.R.P. program with every action. We also call to the Higher Selves of all people working on the H.A.A.R.P. in anyway and ask that they now also become confused, forgetful, and dysfunctional as soon as they enter the gates. Imagine everyone starting to think all the H.A.A.R.P locations are haunted, finding reasons to transfer out of the program to programs that are beneficial to humanity or go into the private sector. Being replaced with a light worker or no one at all. We again call to Michael the Arch angel to take his sword of blue flame and cut the ties to all cars, trucks, company buses, helicopters or planes to get to work. We call the violet flame thru them to clean their energies up, the Angelite energy to heal them and reconnect them to God. Now COMMAND all the vehicles to be neutral and keep breaking down till their owners decide to get another job that is not harmful to any life forms. Let’s ask it be done for all the H.A.A.R.P. locations all over the world. I call to Michael the Archangel, Ganesha the remover of obstacles, all the cosmic beings and the Creator to cut all ties to all artificial plasma in the atmosphere that was H.A.A.RP/reptilian created, that creates a mirror. As we cut the ties to their masters, we cal the violet flame thru all the cells, atoms, molecules, DNA of this plasma to clean it up, now we reconnect it all to the Creator filling it all up with Divine Love. We command it to be neutral and no longer function. See the plasma breaking up and neutralizing itself. Let it not be able to form any square or ring frequency patterns. We place a mirror in front of this mirror to return all signals and frequencies back to the H.A.A.R.P stations. As this is done we see all the H.A.A.R.P equipment imploding on itself. All computers connected with the H.A.A.R.P overloading with this energy that was sent back causing many overloads. We also cut the ties to military buoys connected to the H.A.A.R.P stations and their dark masters. We command that all these buoys be contained in a circle of cement with a lead overlay to jam all frequencies, placing all these buoys in a position of harmlessness. We command the goddess of truth to bring all knowledge up to the people that can put these H.A.A.R.P facilities in a position of harmlessness. As these H.A.A.R.P. facilities break down we see everyone reconnect to the creator becoming awakened spiritual Divine happy beings. Take a deep breath and release it to God & the angels to take and put into use. The more anyone says this action prayer and says it out loud the quicker things will happen. Group energy really is the best for now your energies are amplified x 10,000 each person in the circle. The crystal will amplify it even more. It is great if you all will make this part of your daily prayers then when you meet as a group says it and everyone that is there really give it a lot of energy. Then start paying attention to the news about the H.A.A.R.P. God will find a way to let you know you are being effective. Here is a list of where the HAARPS are located.